For many Indians, no restaurant reservation is made without the trusty consultation with Zomato, India’s first online food guide to go global. Started by two Gurgaon-based employees of consultancy Bain & Co. – Deepinder Goyal and Pankaj Chaddah – in 2008 as a listing of eateries in Delhi’s restaurant hub Hauz Khas, Zomato today has a presence in 11 countries and lists 204,500 + restaurants. Zomato recently raised Rs. 227 crore from Sequoia Capital and InfoEdge in one of the largest funding rounds for a consumer internet company in India.Deepinder Goyal, who holds an integrated masters in Mathematics and Computing from IIT Delhi, talks about the Zomato success story, the kind of people he hires, the work culture at Zomato and the entrepreneurship scene in India. Q)What’s the story behind the name Zomato? A) One of the reasons why we decided to change the name in late 2010 from Foodiebay to Zomato was that we wanted a powerful brand name. After endless debate over several cups of coffee, we came up with the name Zomato. We decided to keep the idea of food at the center and choose a name that is short, easy to remember and makes people think of food. Zomato’s got a zing to it and is originally a play on the word ‘tomato’.We also wanted to avoid any confusion with “ebay”; we wanted to be sure that we weren’t taking any chances when creating a brand we’d want to take international. Focusing on brand recall and communicating what we stand for is of primary importance to any consumer internet company and I think we have got most of it right.Q) What was the biggest challenge you faced while setting Zomato up and while taking it overseas? A)Identifying and hiring the right people has been like looking for a white glove in a snowstorm. One of the biggest challenges faced by any fast-growing company is finding the right talent to fuel growth. Today, we have a team of about 650 people globally, and we’re looking at tripling that number in the near future. We keep innovating in the ways we hire, and try our best to ensure that people fit in well in terms of skill, culture and attitude. However, the challenge continues to be finding the right people for the right job.Another major challenge for us has been to make sure that we have covered each and every street in the cities we’re launching in. The information needs to be relevant and comprehensive for users to keep coming back to use our product. Our data collection teams in each city hit the streets on a daily basis and collect data, first hand. One thing we learned going international is that there is no alternative to doing your own market research or data collection. We send out teams to scout a market before we decide to launch there, and we have our own teams working on gathering data to ensure accuracy and exhaustiveness. 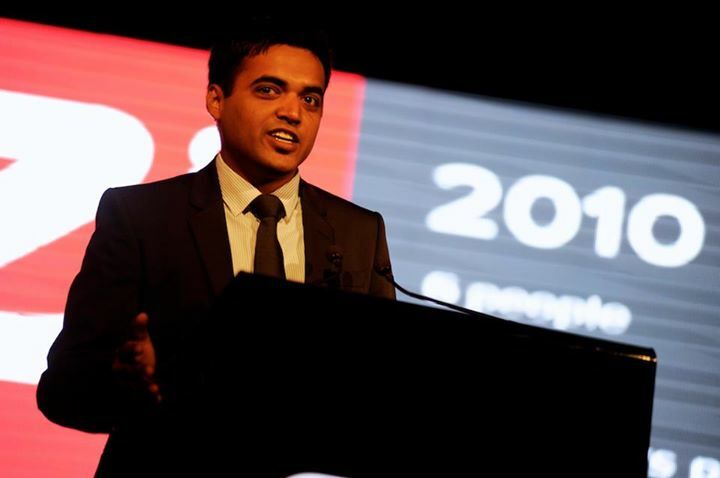 In fact, it was encouraging for the team to see Pankaj, Zomato’s Co-Founder and COO, sweating it out on the streets collecting data in the Dubai summer to launch Zomato UAE two weeks after Ramadan. Q) How is the work environment at the Zomato office? A) Zomato is filled with young, eager, like-minded and enthusiastic individuals. We have some of the smartest people on board with a drive for getting things done. A line that’s often heard – “Zomato is family”. While working at Zomato, we build relationships and friendships that last a lifetime. Our work-spaces are open, with no cabins or walls, so that everyone has access to everyone. All our offices also have an unlimited supply of food, coffee, and internet. The work environment is fast-paced, focused, and fun. Q) What according to you is the best way to keep employees motivated? A) We reward wins and success by celebrating together. We tell every Zoman how they played an important part in building the company. People should be able to proudly say “I built Zomato” as opposed to “I worked with Zomato”. As an organisation we care about values and reward character more than anything else. We will continue to reward and value people for who they are more than for what they can do. A flat hierarchy encourages people to access anyone within the organisation, including the founders, and reach out to them. We have an open feedback policy at Zomato and this keeps people motivated in the work-space. Q) What will we find in your office pantry? A) Bread, eggs to order, peanut butter, Maggi and lots and lots of coffee. Q) What do you look for in a candidate before hiring him at Zomato? A) If the person can go the extra mile, never take no for an answer, and most importantly, can party hard and work even harder. After all, a company is only as good as the people it is made of. They are the ones who carry it forward. The core qualities we look for in people are ethics, respect, attitude and skill – in that order. Putting together the team we have today hasn’t particularly been a cakewalk, but we see the efforts paying off every day. Q) What are the 3 things one should keep in mind while opening a start-up? A) One, focus on one thing at a time, never lose sight of the collective goal, and give it your best shot. Everyone at Zomato works on getting things done and never forgets the larger picture. Two, the cardinal rule for any business idea is that you should create a world-class product. Do not think about money and raising funds upfront; create a valuable product that people would like to use. Three, having a great business idea is nice, but what you do with that idea really counts. It is, after all, not about the idea but the execution of your ideas. Even if you have a product in the market, never stop striving to do better. Keep shipping things. A mandatory prerequisite for this is having good people to work with. Q)What do investors look for most in a start up? What are the hottest entrepreneurship spaces/ industries/categories to be in? A)Investors look for a product that is scalable and adds long-term value. Investors and merchants alike found value in our product because of the up-to-date and relevant content that we provided on an easily accessible platform. Our content base, combined with a solid, scalable revenue model, and a fantastic team that never says die gave our investors the confidence to invest in us.The hottest entrepreneurship space to be in would definitely be the IT space. Q) Name one entrepreneur who has inspired you. Q) How can we make India more entrepreneur-friendly? A)India is among one of the most entrepreneur-friendly nations in the world. Over the past few years we have seen a number of start-ups emerge and shine in the country. It is an exciting time to be a part of this ecosystem; there is a buzz in the air. A lot more can be done to improve the scenario in the country, though. There are some barriers to starting new businesses in India. As a nation we need to value creativity and innovation. So many technologies of our time have their origins in simple solutions that were devised for small inconveniences, which then took off to become products that worked for everyone. The Zomato story is one such. Zomato was created with the intent to make restaurant search easier and comprehensive. There was a need to fill the gap and luckily with the team we have in place right now, we got it right. We should as a nation value entrepreneurs and people with good ideas who put them into practice. Our policy makers should be encouraged to work on creating a conducive environment for entrepreneurial ventures to flourish. Q) If you could give a one word of advice to students planning to take the entrepreneurial plunge, what would that be? Q) What are Zomato’s long term plans? A) We have been focusing on taking our services to as many locations as possible. Post our latest round of funding from Sequoia Capital and Info Edge in November 2013, we are focusing our energies on expanding internationally on a large scale. Over the next 2 years we plan to take Zomato to 22 countries across the Americas, Europe, Southeast Asia, and Australia. Q) You come from an IIT yourself. What do you consider the biggest myth people have about IITs? A) That IIT-ians are only good at studies. Q) One food hangout from your student days at IIT Delhi that you miss the most. A) Sassi – Paranthe walla. Q) Which cities have the best restaurants in India? A) Every city has its own gems. Q) Would you ever combine your entrepreneurial streak with your love for food and start a restaurant? A)Who knows! I plan to take it as it comes. Q) Technology or food. What do you consider a bigger passion? A) Bringing technology to food. This article is adapted from our partner CoolAge. Previous article4 Fitness Secrets of Ripped Entrepreneurs | by Rishabh Gupta, CEO, Letsintern. Next articleTop internships around the world: February 2014(week 2) | IIT Guwahati, Industrial Technology Research Institute - Taiwan, National Centre for Radio Astrophysics - Pune and more.